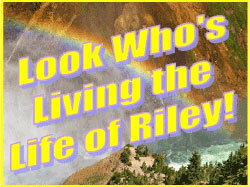 *** WINNERS *** Chelsey, Heidi, Becky and Jennifer are Living the Life of Riley! CONGRATS! I want to give a big and hearty CONGRATULATIONS to Chelsey, the winner of the Umi Children's Shoes of CHOICE! Chelsey now has 48 hours to confirm! I like Toothpaste 2 Go on facebook. I also want to give a big and hearty CONGRATULATIONS to Heidi, the first winner of the Minky Couture blanket giveaway! Heidi has won the Adult Minky (50" x 60") Blanket and now has 48 hours to confirm! I also want to give a big and hearty CONGRATULATIONS to Becky, the second winner of the Minky Couture blanket giveaway! Becky has won the Toddler/Tween/Crib Sized Minky (36" x 50") Blanket and now has 48 hours to confirm! I also want to give a big and hearty CONGRATULATIONS to Jennifer, the third winner of the Minky Couture blanket giveaway! Jennifer has won the Infant Sized Minky (36" x 30") Blanket and now has 48 hours to confirm! *** WINNERS *** Tina and Michelle are Living the Life of Riley! CONGRATULATIONS!